The NT Ultrasound that was discussed during the 12 week article is a scan that will also be used to confirm your dates. Your EDD may stay the same or change by even a day, however it is very rare for a baby to actually be born on this date so overall it does not affect you all that much. Once you have had your NT Scan and received your results, you may be advised to book yourself into the hospital that you plan to have your baby at (if you are having a hospital birth). 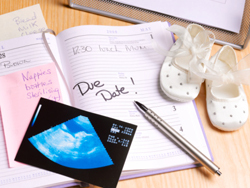 If you have not discussed your options for birth, now may be the time to research and become informed of your options. Your obstetrician will be able to give you some guidance and discuss the options with you, although it will be your final decision after weighing up the pros and cons. Your developing baby is causing the top part of your uterus to rise through the pelvic brim where it can be felt. You may begin to put on some weight now especially if you have not had many problems with morning sickness. The rapid growth of the baby and its support system may mean you begin to “show”. If it is your first baby then you may not “pop” until a little later, however if it isn’t your first then you most likely will have a little baby bump. Your hormones should be settling down, your emotions will be much more under control with less sudden ups and downs. Even some of the other pregnancy symptoms should start to subside especially if you have been suffering severely with morning sickness including nausea and vomiting. Your baby’s blood-cell production and formation will eventually support life outside the womb. Towards the end of this month (week 14) the yolk sac becomes unnecessary as the baby’s developing bone marrow, spleen and liver supersedes the production of blood cells. Vocal cords are beginning to develop and the jaws are already showing 32 permanent tooth buds. Your baby despite its small size of about seven cms from crown to rump, if you were to see your baby today it would be fully formed and would even have tiny little finger prints! All the unique features that make your baby an individual such as facial features are forming. Its eyes and ears are moving into place. The baby’s eyes are around the front of the face however are still wide apart. The ears are moving up from the neck where they were like little gills to the correct position on the side of your baby’s head.